This post goes out to the new graduate nurse this month. It’s an exciting time in your nursing career to be starting out on this journey. I still remember how great it felt to finally be done with school. But make sure they have an awesome orientation program. You want to be in orientation for at least 3-6 months with a preceptor at the latter end of your orientation. You are a new nurse and there is nothing that will kill your enthusiasm quicker then being put on the floor before you are ready. I’d hate to see you leave your first job sooner than expected or worse, leave nursing because of this. Be picky and chose wisely. 2. Start where you want to start. Your first nursing job does not have to be in a hospital. That’s fine if that’s where you want to work but you may be drawn to community nursing or home care. There’s no rule that says you have to get clinical experience in a hospital setting. Nowadays some nursing homes have opened up acute care beds where they accept patients on a temporary basis for needs such as IV antibiotic therapy so don’t rule out long term care facilities as not a place to gain clinical experience. 3. Stay connected with classmates, instructors, people you meet during clinical rotations, it could have been a nursing assistant or tech or even the unit clerk. With social media there is no reason not to stay connected. And you never know who knows who, they may just be the person who gets your foot in the door. 4. Network, Network, Network. Join a nursing association or specialty group in your area and become active. Sign up for LinkedIn and participate in group discussions, become part of the nursing community. 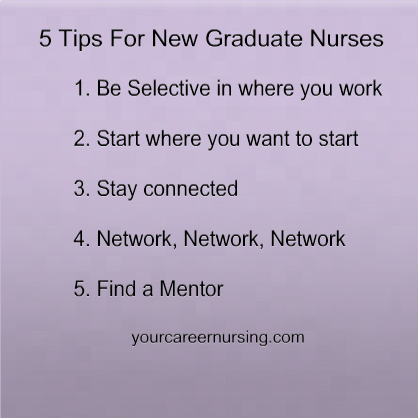 Growing your network should start in nursing school, get to know those you meet along the way as mentioned in tip #3. Add them to your network, keep growing your network, they will be your biggest asset when looking for a nursing job. 5. Find a mentor. This should be a nurse with experience that you trust and can ask questions of and feel comfortable talking to. If you followed tip #4 and #5 you found someone who can be your go to person when situations arise because they will come up. There’s no way you will know everything even if you graduated at top of your class or passed you NCLEX in record time. School won’t prepare you for the real world of nursing and having a mentor to talk to makes a huge difference in your success as a first year nurse. Hope this helps, and I have to say when I worked in a hospital and new nurses were hired I loved working with them because they were full of energy and so eager to learn. I loved teaching so it was a great fit for both of us. So hang in there new graduate nurse, it is so worth it! By staying connected, networking, researching your first nursing job and finding a mentor your first year will go by fast and before long you’ll be helping the next round of new nurses that come after you.